Say hello to flowers, decorative or otherwise with this flowergirl bento. Cute and simple to make, bento like these are a perfect jump off point if you’d like to try your hand at cute bento. 1. Slice some luncheon meat, SPAM or any shaped food that will hold its shape after cooking. Here, I used some sliced SPAM which I cut into flowers using a vegetable cutter. After cutting, I lightly pan-fried the SPAM. If you don’t eat meat, vegetables like carrots and potatoes are a good alternative. If you don’t have a vegetable cutter, a sharp knife will do the trick. 2. Get a vegetable with florets then cook it any way you like. What’s important is to keep the florets intact. Here, I used Ashinaga broccolli, cooked in garlic and olive oil. You can also use regular broccolli, cauliflower, or even asparagus spears. 3. Cook some rice then shape it into a slightly flattened ball. This will be the flower girl’s head. If you’re using Japanese rice, you can even stuff the rice and prepare it as onigiri. Make sure the ball is flattened sufficiently to cover half your bento box while still retaining a spherical shape. 4. Using a sharp pair of kitchen scissors, cut strips of nori to become her hair. One strip should have a fringe cut into it to be her bangs. This is also time to cut out eyes and a mouth. For symmetry, you can fold a piece of nori in half before cutting so you’ll have identical shapes for her eyes. 5. Put divider under her chin. Frilly is good so it’ll look like a dress collar. Here, I used foil cups but that’s all up to you. If you prefer edible dividers, frilly lettuce like Lola Rosa will work too. 6. Place the SPAM on one side and the Asparagus on the other side. You may put them in separate cups or use a divider if you’d like them separate. 7. Cut straight strips out from a tomato to be her arms and half ovals from cheese to be her hands. Place them on top of the SPAM and asparagus so they’ll look like she’s hugging her floral bouquets. 8. Finally, assemble the nori trimmings: add her hair, her eyes and lips. I like assembling the nori parts last because that way, the positioning of the bento components are already final. Nori will stick to the rice and will be hard to reposition if you move something so it’s best to leave it for last. 9. If you have sakura denbu, sprinkle a little on her cheeks for blush. A red tinted condiment, like ketchup or tomato sauce will work too. 10. Smile and take a picture! You have just made your first cute bento! such talent!!! even my picky kids would eat this, wish i have your patience and creativity in making bento dishes! this is soooo pretty! i would like to copy this one of these days…with your permission, of course! my 4-year old daughter will love this…and here teachers, too! haha! Oh my gosh this is so darn cute!!!!!!!!!!!!!!!!! Thanks ces! It shows that I have too much free time on my hands, hahaha! i used to make bento type lunches for my bf when i was still in manila! shucks it has been ages and i miss making them for him. Very cute and nyummy.. 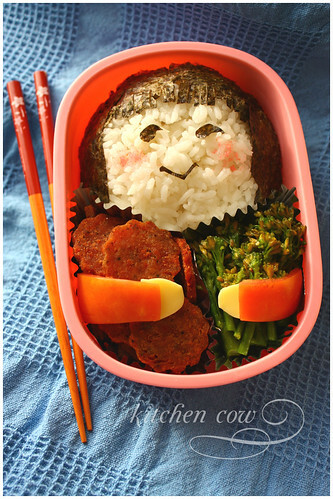 I can’t wait until my son go to school so I can make a cute bento like this for him..